Judging by comments at public education programs I’ve done, cottonmouths are the most misunderstood and maligned of Georgia's six native species of venomous snakes. I have worked in close proximity with many cottonmouths (aka water moccasins) over the years and I encounter dozens each year in the south Georgia swamps where I conduct wetland field work. Yet I’ve never had a cottonmouth chase me – a prominent myth concerning this species – or try to bite me. 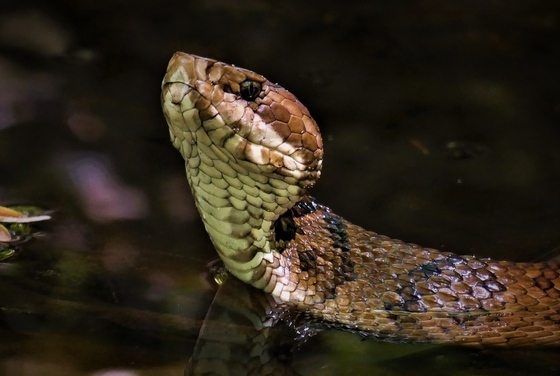 Earlier this month while wading in a narrow, shallow stream in a south Georgia swamp, I met a large eastern cottonmouth – approximately 4 feet long – swimming upstream. My video of the encounter shows the snake's initial curiosity as it tries to figure out what this large obstruction in its path is. After deciding that I’m an animate object and thus a potential predator, the snake decides to avoid the threat by swimming around me. Later, I had to walk back past the snake to get to my car (walking in water where you can see your feet was safer here because the forest is thick with knee-high vegetation). As seen in this segment, the cottonmouth is in a defensive coil. But though alarmed, it still only cowers against the stream bank as I carefully pass by. I do believe people have had snakes, some of which may have been cottonmouths, come toward them in the wild. As the video shows, so have I. But it’s been my experience this invariably happens when the snake is either not aware of my presence until it is very near or it’s fleeing toward refuge, such as a hole in the ground of body of water, and I happen to be between the snake and the refuge. I think both encounters filmed here (video 1 and video 2) underscore those points and hopefully help dispel the cottonmouth’s unfounded reputation as aggressive. Matt Moore, of Statesboro, works as a field technician with The Orianne Society and DNR’s Nongame Conservation Section. His work and the frequent contact it involves with snakes requires training, experience and caution. If you encounter a snake, DNR's recommendation is that you try to identify it only from a distance and give the snake the space it needs. How close? In the first video, the cottonmouth approaches within about 18 inches of Matt Moore's foot. Although close, Matt said he was not in danger of being bitten, or violating safety protocol, because the snake was stretched out. Footwear: If you’re wondering, Matt wears lightweight wading shoes because they are more functional and durable than snake boots for the extensive wading required for his wildlife surveys. To avoid surprises, he said he lets "his eyes go to a place” before his feet or hands do. Learn more: Brochures including “Is It a Water Moccasin?” and “Venomous Snakes of Georgia,” plus other info, are available at www.georgiawildlife.com. Photos of native snake species are on Flickr. 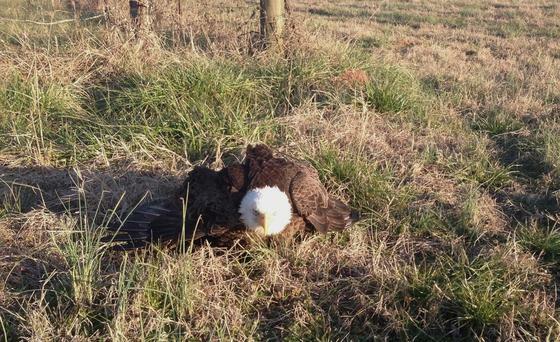 A bald eagle found hurt near LaGrange more than a year ago will be returned to the wild Saturday at West Point Lake. The Southeastern Raptor Center, in conjunction with DNR, plans to release the adult bird at noon near the Pyne Road Park boat ramp. The public is invited. Rehabilitation for this raptor began Feb. 11, 2016. 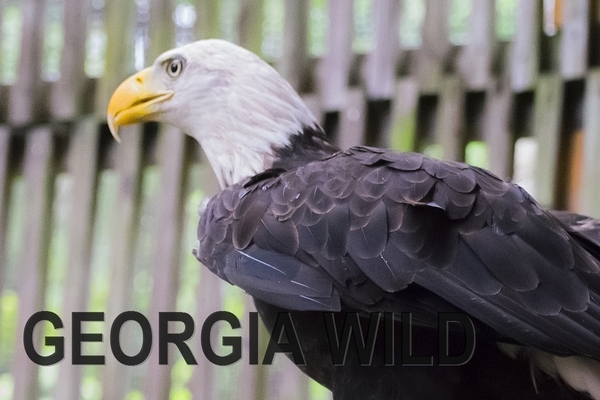 Responding to a call from a citizen, DNR wildlife technician Cody Langford of the Wildlife Resources Division's Game Management Section found the eagle in a hay field in southeast Troup County. Though hurt, the eagle could fly short distances, Langford said. He managed to catch it, and took it to the Southeastern Raptor Center at Auburn University. Dr. Seth Oster, the center’s primary veterinary and an assistant clinical professor and avian veterinary expert at Auburn’s College of Veterinary Medicine, said the bird had an open fracture of the left metacarpus (wing tip), as well as internal bleeding (full case details). “We stabilized the patient and confirmed the fracture with radiographs,” Oster said. “We used a splint to repair the fracture and after six weeks moved the patient to one of our large flight aviaries. The next flight, and the next chapter, for this eagle starts Saturday at West Point. The rehabilitated bird is pictured in the masthead (photo by Southeastern Raptor Center). 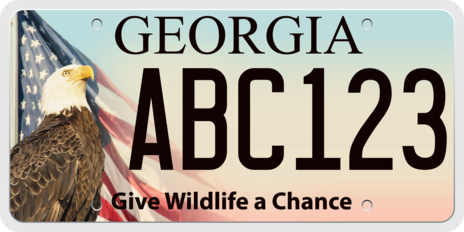 Buying a DNR bald eagle or hummingbird wildlife license plate helps conserve bald eagles and hundreds of other Georgia wildlife and plant species. And renewing these plates, including older designs, each year helps even more. DNR tags cost only $25 more than a standard license plate, and $19 of each purchase and $20 of each annual renewal goes to support conservation. See what DNR is doing to conserve wildlife, rare plants and natural habitats. 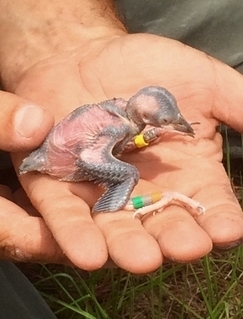 DNR nest surveys of endangered red-cockaded woodpeckers are under way in south Georgia. This chick (right) was banded and returned to its nest at a Thomas County site enrolled in Safe Harbor. Some 176,000 acres, most in the Red Hills region near Thomasville, are enrolled in this private lands program created to help conserve red-cockadeds, the only woodpecker in the U.S. that excavates cavities in living pines. Botanists and other native plant enthusiasts from Tennessee, Alabama and Georgia met this month in Chattanooga, Tenn., for the first joint gathering of the states’ plant conservation alliances. The session, geared to coordinate efforts across state lines, was spurred in part by the Southeastern Partners in Plant Conservation conference in Atlanta last November ("Botanical updates," Nov. 1). The young peregrine falcons at Tallulah Gorge State Park are – or were – in the process of fledgling. Nongame Conservation Section Program Manager Bob Sargent spotted two near the nest shelf last weekend and photos days earlier show the young maturing into sub-adults. 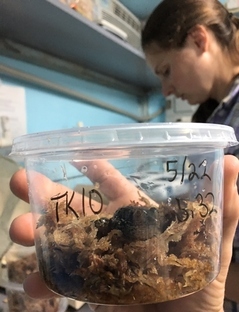 Gopher frogs are transforming from eggs to tadpoles to froglets at the U.S. Fish and Wildlife Service’s Warm Springs National Fish Hatchery. The frogs (checked at right by Vanessa Kinney-Terrell of UGA's Warnell School of Forestry and Natural Resources) will be released at Williams Bluffs Preserve in a project to restore the rare species on The Nature Conservancy property near Blakely. Private landowners who qualify can receive technical assistance and even funding to restore and improve habitat for northern bobwhites through the federal Working Lands for Wildlife program and DNR’s Bobwhite Quail Initiative. Contact the DNR Private Lands Program for details. National Fishing and Boating Week, June 3-11, includes free fishing days -- no fishing or trout licenses needed for Georgia residents -- on Saturday, June 3 and 10. Kids fishing events are also scheduled statewide. Find an event near you. Trace global wind currents on this dynamic Earth-sized map with forecasts updated every three hours by super computers. More on Facebook. 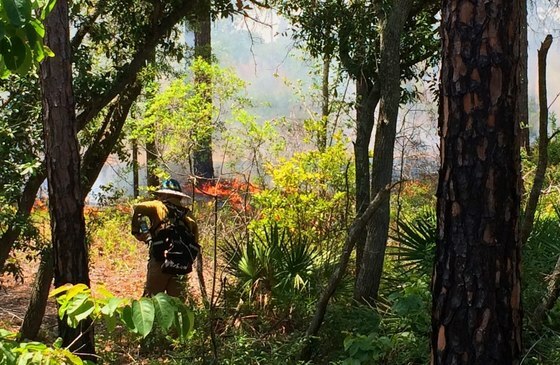 Even before the recent rains, DNR Wildlife Resources Division prescribed fire crews were conducting growing-season burns, including at Alapaha River and Altama Plantation wildlife management areas. These prescribed fires benefit rare and other fire-adapted wildlife and plant species, while also reducing fuel loads and lessening the risk of catastrophic wildfires. The North American Native Bee Collaborative’s free field guide to the genera of bees in Maryland is also considered useful to others east of the Mississippi River, and partially useful to those in the American West. Names in the news: The Regional Director’s Honor Award recipients announced by the U.S. Fish and Wildlife Service Southeast Region for extraordinary conservation accomplishments in 2015 and 2016 included: Dan Forster, former DNR Wildlife Resources Division director and now government relations director for the Archery Trade Association, for his work on state, regional and national levels as “a guiding force in Southeastern species and habitat conservation;” Reese Thompson, a Vidalia landowner and tree farmer deemed a “major contributor to the restoration of longleaf pine in the Southeast by the way he has managed his own lands and the model he has provided for other landowners;” and, Susan Meyers of Monarchs across Georgia, a leader in “conserving monarch butterflies and other pollinators through her hands-on work in schools and communities across Georgia.” See the previous Georgia Wild for DNR employees also honored. July 7-9 – Beyond Becoming an Outdoor-woman (BOW) handgun preparedness course, Charlie Elliott Wildlife Center, Mansfield. Also: July 21-24, Coastal BOW, Sapelo Island; Sept. 8-10, advanced handgun workshop, Charlie Elliott; Nov. 3-5, annual BOW workshop, Charlie Elliott. Program costs vary. – Eagle nest total soars. – Endangered bee watch on. What's up? 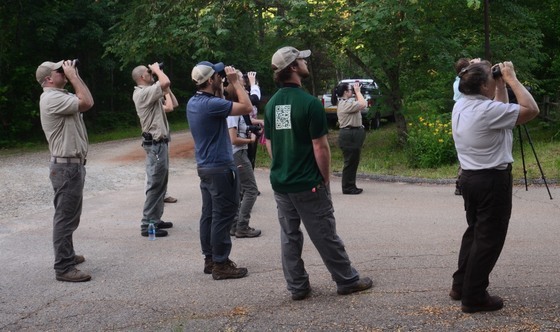 Participants in DNR Nongame Conservation Section’s Piedmont Birding Boot Camp home in on birds as they learn more about identifying species by sight and sound. Wildlife biologist Todd Schneider organized and helped lead four bird ID workshops – dubbed birding boot camps – throughout the state this month. The goal: increase awareness and knowledge of birds so camp-goers can more effectively engage the birding public, better manage state and federal lands for birds, and even help with bird survey work. The workshops also covered bird/habitat relationships and how habitat management affects different bird species. Sixty people, including staff and volunteers from DNR’s Wildlife Resources and State Parks & Historic Sites divisions, the U.S. Fish and Wildlife Service, and the U.S. Forest Service, took part. Why focus on birds? Of the 2.4 million U.S. residents who went wildlife-watching in Georgia in 2011, nearly 80 percent were watching birds.